Have We Reached Peak Google? Google owns search, but are they a one trick pony? A couple weeks ago Ben Thompson published an interesting article suggesting Google may follow IBM and Microsoft in peaking, perhaps with native ads becoming more dominant than online search ads. 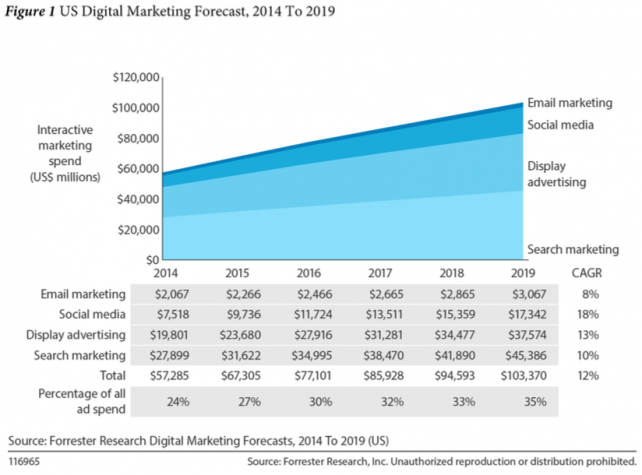 According to Forrester, in a couple years digital ad spend will overtake TV ad spend. In spite of the rise of sponsored content, native isn't even broken out as a category. Part of the issue with native advertising is it can be blurry to break out some of it. Some of it is obvious, but falls into multiple categories, like video ads on YouTube. Some of it is obvious, but relatively new & thus lacking in scale. Amazon is extending their payment services & Prime shipping deals to third party sites of brands like AllSaints & listing inventory from those sites on Amazon.com, selling them traffic on a CPC basis. Does that count as native advertising? What about a ticket broker or hotel booking site syndicating their inventory to a meta search site? And while native is not broken out, Google already offers native ad management features in DoubleClick and has partnered with some of the more well known players like BuzzFeed. Time intends to test paywalls on all of its major titles next year & they are working with third parties to integrate affiliate ads on sites like People.com. The second link in the above sentence goes to an article which is behind a paywall. On Twitter I often link to WSJ articles which are behind a paywall. Any important information behind a paywall may quickly spread beyond it, but typically a competing free site which (re)reports on whatever is behind the paywall is shared more, spreads further on social, generates more additional coverage on forums and discussion sites like Hacker News, gets highlighted on aggregators like TechMeme, gets more links, ranks higher, and becomes the default/canonical source of the story. Part of the rub of the penny gap is the cost of the friction vastly exceeds the financial cost. Those who can flow attention around the payment can typically make more by tracking and monetizing user behavior than they could by charging users incrementally a cent here and a nickel there. Well known franchises are forced to offer a free version or they eventually cede their market position. There are sites which do roll up subscriptions to a variety of sites at once, but some of them which had stub articles requiring payment to access like Highbeam Research got torched by Panda. If the barrier to entry to get to the content is too high the engagement metrics are likely to be terrible & a penalty ensues. Even a general registration wall is too high of a barrier to entry for some sites. Google demands whatever content is shown to them be visible to end users & if there is a miss match that is considered cloaking - unless the miss match is due to monetizing by using Google's content locking consumer surveys. Who gets to the scale needed to have enough consumer demand to be able to charge an ongoing subscription for access to a variety of third party content? There are a handful of players in music (Apple, Spotify, Pandora, etc) & a handful of players in video (Netflix, Hulu, Amazon Prime), but outside of those most paid subscription sites are about finance or niche topics with small scale. And whatever goes behind the paywalls gets seen by almost nobody when compared against to the broader public market at the free pricepoint. One doesn't need to be a genius to connect the dots. I've long argued Google has leveraged piracy to secure favorable media deals (see the second bullet point at the bottom of this infographic). Some might have perceived my take as being cynical, but when Google mentioned their "continued progress on fighting piracy" the first thing they mentioned was more ad units. There are free options, paid options & the blurry lines in between which Google & YouTube ride while they experiment with business models and monetize the flow of traffic to the paid options. There is a massive misalignment of values which causes many players to have to refine their strategy over and over again. The gray area is never static. Many businesses only have a 10% or 15% profit margin. An online publishing company which sees 20% of its traffic disappear might thus go from sustainable to bleeding cash overnight. A company which can arbitrarily shift / redirect a large amount of traffic online might describe itself as a "kingmaker." In Germany some publishers wanted to be paid to be in the Google index. 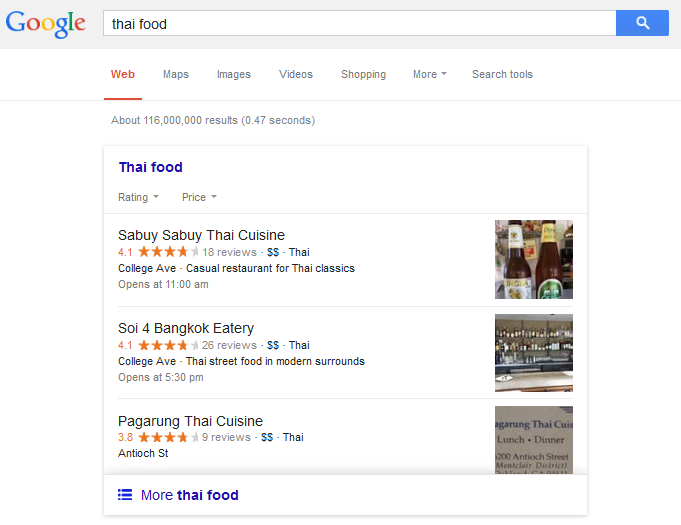 As a result Google stopped showing snippets near their listings. Google also refined their news search integration into the regular search results to include a broader selection of sources including social sites like Reddit. As a result Axel Springer quickly found itself begging for things to go back to the way they were before as their Google search traffic declined 40% and their Google News traffic declined 80%. Axel Springer got their descriptions back, but the "in the news" change remains. If Google could have that dramatic of an impact on Axel Springer, imagine what sort of influence they have on millions of other smaller and weaker online businesses. One of the craziest examples is Demand Media. Demand Media's market cap peaked above $1.9 billion. They spun out the domain name portion of the business into a company named Rightside Group, but the content portion of the business is valued at essentially nothing. They have about $40 million in cash & equivalents. Earlier this year they acquired Saatchi Art for $17 million & last year they acquired ecommerce marketplace Society6 for $94 million. After their last quarterly result their stock closed down 16.83% & Thursday they were down another 6.32%, given them a market capitalization of $102 million. By the end of 2014, we anticipate more than 50.000 articles will be substantially improved by rewrites made rich with great visuals. (on the above 2 changes) These changes are expected to have a negative impact on revenues and adjusted EBITDA of approximately $15 million on an annualized basis. Through Q3 we have invested $1.1 million in content renovation costs and expect approximately another $1 million in Q4 and $2 million to $4 million in the first half of next year. if you look at visits or you know the mobile mix is growing which has lower CPM associated with it and then also on desktop we're seeing compression on the pricing line as well. we know that sites that have ad density that's too high, not only are they offending audiences in near term, you are penalized with respect to where you show up in search indexes as well. 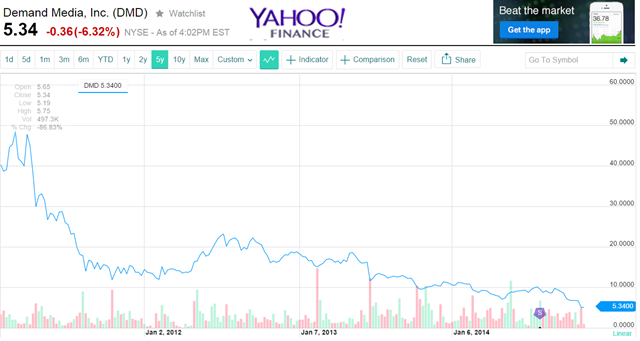 Google torched eHow in April of 2011. In spite of over 3 years of pain, Demand Media is still letting Google drive their strategy, in some cases spending millions of dollars to undo past investments. Yet when you look at Google's search results page, they are doing the opposite of the above strategy: more scraping of third party content coupled with more & larger ad units. Originally the source links in the scrape-n-displace program were light gray. They only turned blue after a journalist started working on a story about 10 blue links. The search results can be designed to have some aspects blend in while others stand out. Colors can change periodically to alter response rates in desirable ways. The banner ad got a bad rap as publishers have fought declining CPMs by adding more advertisements to their pages. When it works, Google's infrastructure still delivers (and tracks) billions of daily banner ads. Search ads have never had the performance decline banner ads have. The closest thing Google ever faced on that front was when AdBlock Plus became popular. Since it was blocking search ads, Google banned them & then restored them as they eventually negotiated a deal to pay them to display ads on Google while they continued to block ads on other third party sites. Search itself *is* the ultimate native advertising platform. 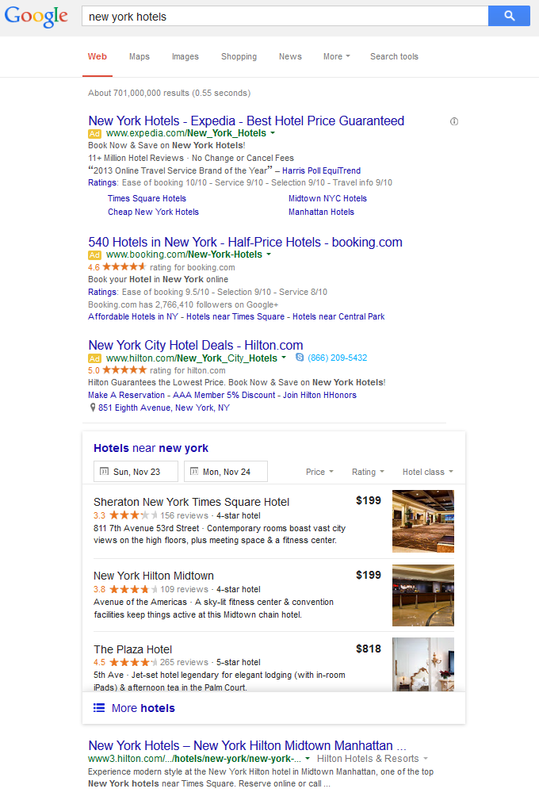 Google is doing away with the local carousel in favor of a 3 pack local listing in categories like hotels. 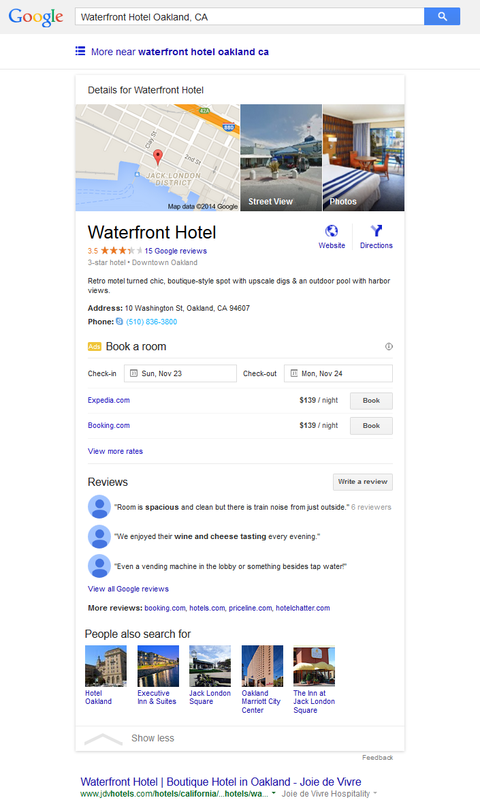 Once a person clicks on one of the hotel listings, Google then inserts an inline knowledge graph listing for that hotel with booking affiliate links inline in the search results, displacing the organic result set below the fold. Notice in the above graphic how the "website" link uses generic text, is aligned toward the right, and is right next to an image so that it looks like an ad. It is engineered to feel like an ad and be ignored. The actual ads are left aligned and look like regular text links. They have an ad label, but that label is a couple lines up from them & there are multiple horizontal lines between the label and the actual ad units. Not only does Google have the ability to shift the layout in such a drastic format, but then with whatever remains they also get to determine who they act against & who they don't. While the SEO industry debates the "ethics" of various marketing techniques Google has their eye on the prize & is displacing the entire ecosystem wholesale. Users were generally unable to distinguish between ads and organic listings *before* Google started mixing the two in their knowledge graph. That is a big part of the reason search ads have never seen the engagement declines banner ads have seen. Mobile has been redesigned with the same thinking in mind. Google action items (which can eventually be monetized) up top & everything else pushed down the page. The blurring of "knowledge" and ads allows Google to test entering category after category (like doctor calls from the search results) & forcing advertisers to pay for the various tests while Google collects data. NO LINK to the restaurant website. Google justifies their scrape-n-displace programs by claiming they are put users first. Then they hide some of the information to drive incremental monetization opportunities. Google may eventually re-add some of those basic features which are now hidden, but as part of sponsored local listings. After all - ads are the solution to everything. Do branded banner ads in the search results have a low response rate? Or are advertisers unwilling to pay a significant sum for them? If so, Google can end the test and instead shift to include a product carousel in the search results, driving traffic to Google Shopping. That money grab stuff has virtually no limit. 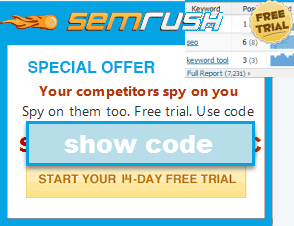 Off the start keywords defaulted to broad match. Then campaigns went "enhanced" so advertisers were forced to eat lower quality clicks on mobile devices. Then there was the blurring exact match targeting into something else, forcing advertisers to buy lower quality variations of searches & making them add tons of negative keywords (and keep eating new garbage re-interpretations of words) in order to run a fine tuned campaign specifically targeted against a term. In the past some PPC folks cheered obfuscation of organic search, thinking "this will never happen to me." And of course Google not only wants to be the ad auction, but they want to be your SEM platform managing your spend & they are suggesting you can leverage the "power" of automated auction time biding. Advertisers RAVE about the success of Google's automatic bidding features: "It received one click. That click cost $362.63." The only thing better than that is banner ads in free mobile tap games targeted at children. Above I mentioned how Google arbitrarily banned the AdBlock Plus extension from the Play store. They also repeatedly banned Disconnect Mobile. If you depend on mobile phones for distribution it is hard to get around Google. What's more they also collect performance data, internally launch competing apps, and invest in third party apps. And they control the prices various apps pay for advertising across their broad network. Those friction adders have real world consequences. A year ago Groupon blamed Gmail's tabs for causing them to have poor quarterly results. The filtering impact on a start up can be even more extreme. A small shift in exposure can lower the K factor to something below 1 & require the startups to buy exposure rather than generating it virally. In addition to those other tabs, there are a host of other risks like being labeled as spam or having a security warning. Few sites are as widely read inside the Googleplex as Search Engine Land, yet at one point even their newsletter was showing a warning in Gmail. video on YouTube by counting ad views as organic views, changing the relevancy metrics, and investing in competing channels & giving them preferential exposure as part of the deal. YouTube gets over half their views on mobile devices with small screens, so any shift on Google's rank preference is going to have a major shift in click distributions. The launch of Keyword (not provided) which hid organic search keyword data was friction for the sake of it in organic search. When Google announced HTTPS as a ranking signal, Netmeg wrote: "It's about ad targeting, and who gets to profile you, and who doesn't. Mark my words." In the conversations this week, with companies like Krux, BlueKai and Lotame, Google told data management platform players that they could not use pixels in certain ads. The pixels—embedded within digital ads—help marketers target and understand how many times a given user has seen their messages online. "Google is only allowing data management platforms to fire pixels on creative assets that they're serving, on impressions they bought, through the Google Display Network," said Mike Moreau, chief solutions officer at Krux. "So they're starting with a very narrow scope." Around the same time Google was cracking down on data sharing, they began offering features targeting consumers across devices & announced custom affinity audiences which allow advertisers to target audiences who visit any particular website. Google's special role is not only as an organizer (and obfuscator) of information, but then they get to be the source measuromg how well marketing works via their analytics, which can regularly launch new reports which may causually over-represent their own contribution while under-representing some other channels, profiting from activity bias. The industry default of last click attribution driving search ad spending is one of the key issues which has driven down display ad values over the years. Google not only ranks the ecosystem, but they actively invest in it. Google tried to buy Yelp. When Facebook took off Google invested in Zynga to get access to data, in spite of a sketchy background. When Google's $6 billion offer for Groupon didn't close the deal, Google quickly partnered with over a dozen Groupon competitors & created new offer ad units in the search results. Inside of the YouTube ecosystem Google also holds equity stakes in leading publishers like Machinima and Vevo. There have been a few examples of investments getting special treatment, getting benefit of the doubt, or access to non-public information. The scary scenario for publishers might sound something like this: "in Baidu Maps you can find a hotel, check room availability, and make a booking, all inside the app." There's no need to leave the search engine. Take a closer look & that scary version might already be here. Google's same day delivery boss moved to Uber and Google added Uber pickups and price estimates to their mobile Maps app. as subprime auto loans have become widespread, Uber has pushed an extreme version of them onto their drivers while cutting their rates - an echo of the utopia of years gone by. Combining usage data from their search engine, web browser, app store & mobile OS gives them unparalleled insights into almost any business. Google committed to spending as much as a half billion dollars promoting their shopping express delivery service. Google's fiber push now includes offering business internet services. Elon Musk is looking into offering satellite internet services - with an ex-Googler. Retire all government employees with full pensions. Transfer administrative authority to the tech industry. Appoint Eric Schmidt CEO of America. That Googler may be crazy or a troll, but even if we don't get their nightmare scenario, if the regulators come from a particular company, that company is unlikely to end up hurt by regulations. If there are relevant complaints about Google, who will hear them when Googlers head key government roles? "the world’s most powerful internet company is ready to trade the cash from its search engine monopoly for a slice of the next century’s technological bonanza." ... "As Page sees it, it all comes down to ambition – a commodity of which the world simply doesn’t have a large enough supply." "in a capitalist system, he suggests, the elimination of inefficiency through technology has to be pursued to its logical conclusion." There are some dark layers which are apparently "incidental side effects" of the techno-utopian desires. Those business savings are crucial to Rifkin’s vision of the Third Industrial Revolution, not simply because they have the potential to bring down the price of consumer goods, but because, for the first time, a central tenet of capitalism—that increased productivity requires increased human labor—will no longer hold. And once productivity is unmoored from labor, he argues, capitalism will not be able to support itself, either ideologically or practically. That is not to say "all will fail" due to technology. Some will succeed wildly. Michelle Phan has been able to leverage her popularity on YouTube to launch a makeup subscription service which is at an $84 million per year revenue run rate. Those at the top of the hierarchy will get an additional boost. Such edge case success stories will be marketed offline to pull more people onto the platform. While a "star based" compensation system makes a few people well off, most people publishing on those platforms won't see any financial benefit from their efforts. Worse yet, a lot of the "viral" success stories are driven by a large ad budget. Even Google has done research on income inequality in attention economies - and that was before they dialed up their brand bias stuff. Workers, in turn, have more mobility and a semblance of greater control over their working lives. But is any of it worth it when we can’t afford health insurance or don’t know how much the next gig might pay, or when it might come? When an app’s terms of service agreement is the closest thing we have to an employment contract? When work orders come through a smartphone and we know that if we don’t respond immediately, we might not get such an opportunity again? When we can’t even talk to another human being about the task at hand and we must work nonstop just to make minimum wage? Google philosophically does not believe in customer service, but they feel they should grade others on their customer service and remove businesses which don't respond well to culturally unaware outsourced third world labor. Google gets people to upload pirate content to YouTube & then uses the existence of the piracy to sell ads. They can also use YouTube to report on the quality of various ISPs, while also blocking competing search engines and apps from being able to access YouTube. PageRank extracts the value of editorial votes, allowing Google to leverage the work of editors to refine their search rankings without requiring people to visit the sites. Mix in the couple years Google spent fearmongering about links and it is not surprising to see the Yahoo Directory shut down. Remember the time a Google "contractor" did a manual scrape of Mocality in Kenya, then called up the businesses and lied to them to try to get them onto Google? I'd link to the original Mocality blog post, but Mocality Kenya has shut down. Google also scraped reviews (sometimes without attribution) & only failed at it when players large enough to be heard by Government regulators complained. This is why government scrutiny of Google is so important. It is one of the few things they actually respond to. The smart home will turn household appliances into lead generation devices. In SEO for a number of years many people have painted brand as the solution to everything. But consider the hotel search results which are 100% monetized above the fold - even if you have a brand, you still must pay to play. Or consider the Google Shopping ads which are now being tested on branded navigational searches. Google even obtained a patent for targeting ads aimed at monetizing named entities. You paid to build the brand. Then you pay Google again - "or else." One could choose to opt out of Google ad products so as not to pay to arbitrage themselves, but Google is willing to harm their own relevancy to extract revenues. 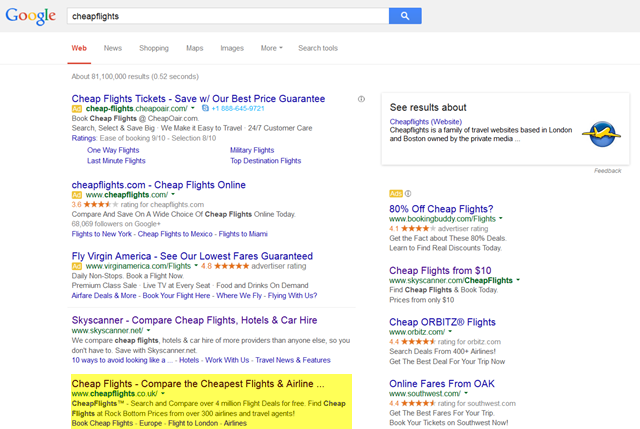 A search in the UK for the trademark term [cheapflights] is converted into the generic search [cheap flights]. The official site is ranking #2 organically and is the 20th clickable link in the left rail of the search results. As much as brand is an asset, it also becomes a liability if you have to pay again for every time someone looks for your brand. Mobile apps may be a way around Google, but again it is worth noting Google owns the operating system and guarantees themselves default placement across a wide array of verticals through bundling contracts with manufacturers. Another thing worth considering with mobile is new notification features tied to the operating systems are unbundling apps & Google has apps like Google Now which tie into many verticals. ... it is hard to think they've come anywhere close to peaking. I sacrificed my time to open an account here just to say one thing. Amazing job. I am a huge fun of such merithorical-rich and interesting articles. Keep the good work dude. Google controls the search engine, the web browser, and the operating system (they created two just to be safe.) IE may still appear dominant on desktop, but on a connected-devices basis it no longer matters (already out of date chart from Benedict Evans http://static.squarespace.com/static/50363cf324ac8e905e7df861/t/51eaf3f2... .) As Google continues to integrate proprietary APIs in to core features of Android, it is only a matter of time before the best phones are 100% Google hardware and software. The open source nature of Android, at that point, will be viewed as a clever business move to disrupt Apple -- a sure bet now, given Apple's current determiniation to become a fashion company. "The pace of progress in artificial intelligence (I'm not referring to narrow AI) is incredibly fast. Unless you have direct exposure to groups like Deepmind, you have no idea how fast-it is growing at a pace close to exponential. The risk of something seriously dangerous happening is in the five year timeframe. 10 years at most. This is not a case of crying wolf about something I don't understand." Deepmind is now owned by Google. On Youtube there is a very impressive video of Deepmind playing & rapidly mastering Atari games solely on visual output earlier this spring. Computational power is a physical limit to scaling AI once the science is mastered. Google has the datacenters & engineering knowledge to do this. Amazon perhaps too, but its unknown if they have the technology. There is no question that Larry, Sergey, Elon, Ray (Kurzweil), Mark, and many of the most powerful figures in tech today have a good understanding of the dystopian potential of technology. Elon's comments over the past few years are particularly relevant to the realistic nature of these concerns. As an intelligence power (intelligence in terms of information gathering, not AI), I suspect the will & ability of US government regulation will be minimal. A successful & powerful Google is now seen as critical to the US national interest. Snowden disclosures have caused Google to tighten their own ship, giving them even more leverage with those agencies involved in national defense and ultimately regulators. The accelerating nature of technology, the instant deployment of software, and the ability to show something different to everyone makes meaningful regulation even more difficult. Not an area I hold any optimism for a successful outcome in. In retrospect it may now be too late. Search should have been a crowd sourced platform, following in the footsteps of Wikipedia. Rather, today we have a Yellow Pages -- full of ads, bankrolling a machine that will probably become the first & dominent AI. Software should have remained platforms controlled largely by the users, and hardware things that someone else's software was installed on by choice. For those of us who have read "SuperIntelligence" by Nick Bostrom (and recommended by Elon Musk), a worst case scenario could happen much too soon. I love when you leave those sorts of meaty comments. Thank you for sharing your insights and in-depth analysis of the matter, Aaron. If we think about it business terms, Google's monopoly of the system can be a scary thought. Your study just affirms how we should look to the future of SEO. What would be left if Google is left to their own devices? How will online search be 10 years from now? We need to be smarter than ever; while at the same time, keep a close eye on the search engine giant. Aaron, this is a great post about how Google has weaseled its way into the highest rooms of power in the United States. It's probably fairly dense for someone who hasn't read your work before or is very familiar with the commercial search landscape but I appreciate your shorthand. It's special power Google enjoy, not very different from Microsoft when MS was the back door into the computers of the world. I vividly remember my astonishment when I found the hidden indexed ASCII file of all my emails on a very old Microsoft OS. First step out of the matrix. Your article deals with the much more sophisticated methods Google is using to spy on us for their masters and partners in government and to constrict commerce. What's needed is for someone to do search better than Google. Five years ago that would have been difficult. Given how Google has polluted its own results, I don't think it's as difficult. The only path to reform for Google is competition. Yet I'm astonished at how poor the SERPs of Yahoo, Bing and DuckDuckGo when I try them (fairly regularly). To be honest, you shouldn't be complaining about Google at this point but leading a play against them. Some thoughts on how below. This post meant to make another point: the hive mind. In the old days, you, I, Nick, graywolf and the others could outsmart Google. As lone wolves, we could hunt and kill on their prairies. Over the years, Google just built up and built up its hive mind. Now like a borg, Google lays waste to whole industries with a shrug. Resistance is futile. It's astonishing given the Snowden revelations (which just confirmed with documents, what any thoughtful observer had noticed) that people continue to use Google. Yet my own company remains infested with Google. I have my own account(s) which I'm gradually learning to keep confined to a single browser (not much help, Google can collate IP's and cookie me anonymously and then fingerprint the secondary browsers). The only exit which can save our privacy and restore some semblance of balance to business is if someone else destroys Google in search. The winning hand here is burn ratio. Google has become a top-heavy dosh devouring monster. A lean start-up (like Google in the early days) would not require nearly as much feeding. Anyone with the sense to buy and amalgamate Delicious, Pinboard and some data from the other bookmarking services could give Google a good run for their money. With just their own internal data, Facebook could offer better results than Google fairly quickly. Aaron, you should consider how you could lead a challenge to Google. You'd need allies of course but rich ones are out there, many of them who like to make big bets at the high stakes tables.